The back-to-school blues giveaway winner is Crazy Vegan Mom! (ha, that could be my blog name as well!) Congrats! :) Please e-mail me at dreena@everydayvegan.com so I can get your mailing details. Quinoa Nicoise. Elements of the classic Nicoise salad (green beans, tomatoes, potatoes, olives but obviously without the tuna, eggs, and anchovies) worked into a quinoa salad tossed with a tangy caper-tarragon vinaigrette. I love this salad, and it makes a terrific potluck item. Back with more soon... have a sweet day and some bake up something to make your house smell divine! Congrats to the winner! She'll love the book. Oh, I do love a Nicoise salad (a vegan version, of course). There's just something so right about olives and capers! yum! those look great. You know, I recently made the VLV lentil patties for the first time.... I guess it took me a while to try that one because i never got around to making gluten free bread crumbs. Anyways, my husband, my in-laws and a friend have all tried them and loved them! So the second time around I made a double batch and froze a bunch. What would I do without your recipes?! Mmmm I am LOVING those brownies!! 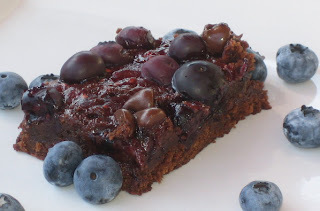 Those berry-patch brownies look good! !